Rutherfordton is known for being one of the most historic towns in Western North Carolina, but is just as famous for its scenic beauty. Located at the foot of the Blue Ridge Mountains, this charming area is home to a vibrant local community. Immerse yourself in this scenic area by forgoing the usual hotels and B&Bs and choosing a vacation rental home. Experience this incredible town as a local for a truly unforgettable experience. As your local Rutherfordton real estate expert, check out my list of the most unique vacation rentals for an unforgettable experience. This beautiful rental home offers a unique blend of modern and traditional, just moments away from central Rutherfordton and the Tryon International Equestrian Center. 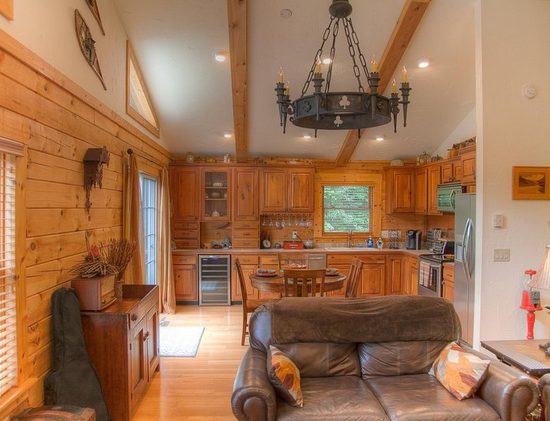 Restin Quarters has it all, with spacious accommodations, a full kitchen, and incredible nature views. Step through the doors of Restin Quarters, and you’ll feel that this is truly a home away from home —except maybe better! Complete with a flat screen TV and game table, you’ll never want to leave this fantastic rental. Enjoy spending nights on the front porch stargazing, or roasting marshmallows over its fire pit. 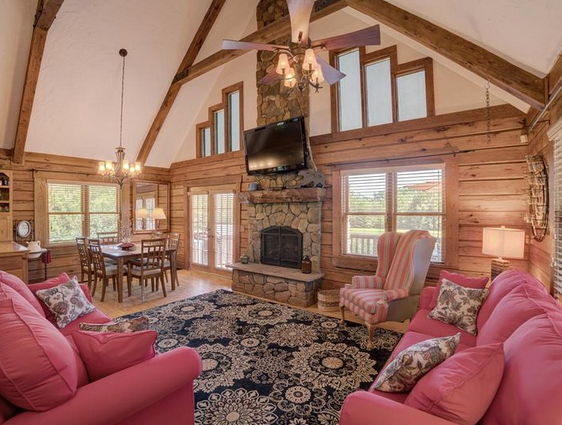 Plus, located in Green River Highlands, this gorgeous nature retreat provides easy access to a host of amenities and is only 20 minutes away from Chimney Rock and Lake Lure for countless adventures. A log cabin like no other, River Wilderness is a fantastic mix of rustic and luxury features. A two bedroom, two bathroom rental, this fantastic property is located on 2 acres of private property, making it perfect for a serene escape. Hardwood floors and cathedral ceilings give this rental home a charming, traditional feel, perfectly juxtaposed with its upgraded luxury amenities. Those who don’t want to fully unplug from the modern world will enjoy multiple flat panel TVs and iPhone docking stations throughout River Wilderness. Truly unwind in the midst of nature in the large soaking tub in the master bathroom. 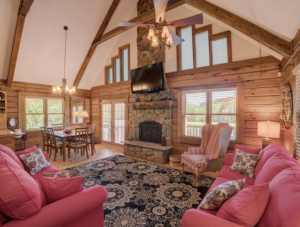 Egyptian cotton towels and Turkish cotton robes will make this home feel like your own private spa set against some of the most beautiful scenery in all of North Carolina. This cabin is perfect for those who are looking to reconnect with nature without having to “rough it!” Ridge View Cabin is located on over two acres of land, and is part of the Green River Highlands, giving visitors access to expansive outdoor space and the Green River for all the kayaking, hiking, and outdoor recreation they can handle! Hardwood floors, cathedral ceilings and incredible views give Ridge View quaint charm, but this gorgeous rental is also host to top-notch modern amenities. Featuring two bedrooms, this cabin also includes a full kitchen with new appliances and laundry room for your convenience. 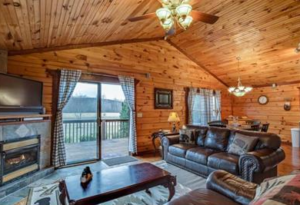 Whether you’re looking for blissful seclusion from your surroundings, or you never want to be be disconnected from the outside world, you’ll love the options of Ridge View Cabin, which comes with available in-home wifi and satellite TV. Ridge View truly has everything you need for a tranquil immersive retreat to simply a refreshing weekend getaway. Looking to experience gorgeous mountain views in one of the most historic towns in North Carolina? It’s time to visit Rutherfordton! As your local real estate experts, we’re happy to answer any questions about Rutherfordton, or its surrounding area! We would love to give you a personal tour or help you choose the perfect home rental for your memorable vacation. Contact us today to get started!